This safari package includes 4 nights camping accommodation at Alasamo Manyara Campsite, Seronera Campsite, Ngorongoro Simba Campsite, and 2 nights’ hotel accommodation before and after the safari. After breakfast, you will proceed to Lake Manyara for a full day game drive in beautiful Manyara National Park. See buffalo, giraffe, zebra and many more species, all set against the stunning backdrop of the Great Rift Wall. Dinner and stay overnight at Alasamo Manyara Campsite. Enjoy the endless open plains and stunning skies of Serengeti, a scenic 4-hour drive, and full day game drive together with late evening game drive. 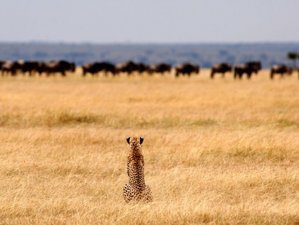 Serengeti National Park is where you can see the Big Five. Foot Slopes Tours & Safaris’ driver / guide will contact with other drivers about where the animal is, so that you can track the Big Five. Dinner and stay overnight at Seronera Campsite. After a relaxing morning and an early lunch, proceed with a game drive to Ngorongoro where Foot Slopes Tours & Safaris’ driver / guide will continue to explain you about the animal and natural beauty of the country on the way to Ngorongoro Crater. You will spend a night on the crater rim. Dinner and overnight at Ngorongoro Simba Campsite. After an early breakfast, proceed directly to the crater floor for a full day crater tour with picnic lunches. Later, proceed back to Arusha in the evening. Dinner and stay overnight at a hotel. At the Momella Gate, an armed ranger will be waiting to accompany you on a walking safari that will give you the chance to experience the wildlife up-close. Only a few other national parks in Tanzania give you such an opportunity and it is something that should not be missed. This safari will take you to visit Lake Manyara National Park, Serengeti National Park, Ngorongoro Crater, and Arusha National Park. Lake Manyara National Park is a protected area which hosts giant flamingo colonies, waterfowls, elephants, hippopotami, buffalos, guenons, banded mongooses, and numerous types of gazelles and antelopes. The park is also well known for its “tree climbing lions”. Serengeti National Park is one of the most famous national parks in the world, known for its magnificent lions and great migration. It is one of the most comprehensive and appealing presentations of nature, conservation, and research in general. Every day, hundreds of nature lovers and tourists from all over the world visit it. Arusha National Park has an incredible variety of fauna and flora, which cannot fail to impress. Hollywood also chose this region to film the movie "Hartari" in which Hardy Kruger starred alongside the legendary John Wayne. You will also visit the Ngurdoto Crater, affectionately known as the “Little Ngorongoro”. Buffaloes, waterbucks, giraffes, warthogs and zebras can all be seen all year round here as well as many different bird species. The elephants are a little shyer here but with patience and some good luck, can sometimes be spotted. You may also spot a leopard. You will be served breakfast, picnic lunch, and dinner during this safari. Foot Slopes Tours & Safaris is a full registered travel company dedicated to giving you a genuinely personalized service that delivers the best holiday experience in Tanzania.